We zip through the winding roads, amidst acres of lush green dotted with lakes. Grey skies with bursting thunderclouds pass by… It seemed that nature itself had turned into a song. The spreading mist draws over the green landscape. The car speeds up the hill, as I recognize the familiar curves of the hairpin bends. So what is it that keeps drawing me to this green paradise every monsoon? It can’t be put in words. You just need to be there to experience it. A slow pouring rain blends with the surrounding lacy mist, unraveling the enchanting countryside. Herds of cattle pass by with herdsmen in raincoats and rubber boots. Just around the bend, we stop for some hot masala tea. The invigorating flavors of mountain spices flow down my throat. I ask for another cup. The ride continues alongside endless fields of paddy skirted by towering eucalyptus trees drenched in rain. Life seemed to slow down. We enter the path to our destination, dotted by scarlet posies and yellow coffee beans leaning over the fences. The car comes to a halt. 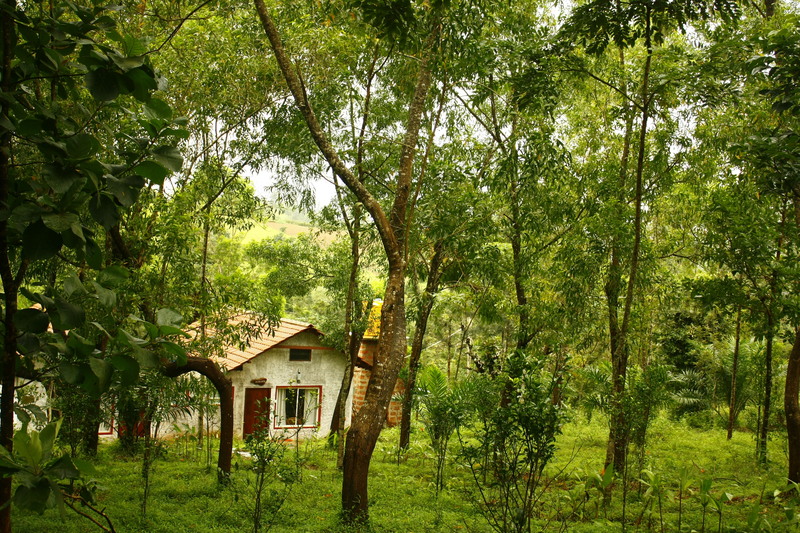 We have arrived at “SWARGA” – a perfect home-stay nestled amidst the wilderness. From somewhere a thrush calls out, probably announcing our arrival. “Swarga” is an eco-friendly home-stay- a piece of emerald, hidden and nestled in the grazing Gomala lands situated in Sakleshpur, Karnataka. Sprawling meadows surround the home-stay fringed by coffee, pepper, and cardamom plantations. We are greeted by Chirag – the owner, who leads us to our cottage. The cottages here are named after the 5 elements of nature –Chandra, Surya, Prithvi, Jala and Vayu. Tariffs include Rs.2250/- per head, which includes breakfast, lunch and dinner. The home-stay is 6 years old, overlooking the ‘Hemavathi’ river. It is home to around 70 species of birds, which makes this a bird watcher’s paradise. Some of the finest coffee in the world is grown in these plantations. You can get a tour of coffee processing between October and March. The cottages are well furnished with solar powered lighting. The home-stay is a haven for Chirag’s pets which include 9 dogs and the ever-inquisitive race horse called “Jack”. Activities include nature walks, treks around the plantations, angling at the river, swimming during summers, bird watching and photography (between Jan to Mar). Overall, it’s a break from the hustle and bustle of the city life, to be out in the wilderness and as Chirag puts it – “Just do nothing!” It provides a promising break for Monsoon lovers. After all, you are entering into rain-land – ‘Malnad’. You get a delicious touch of Malnad cuisine as well – fresh garden salads, spicy peanuts, country chicken, and a variety of vegetable preparations – all Malnad style. The helpers consist of a 7-staffed team, ever ready to be of service. The home-stay boasts of a bar with indoor games as well. An exclusive sports bar is in the making. Spend a lazy afternoon with a drink, listening to the wind chimes and the rhythm of the rain. Or climb up a tree house to indulge in some bird watching and photography over a cup of invigorating expresso! “Swarga” also provides a stopover for cyclists on the way to Coorg and Mangalore. The place is well connected by train and bus routes from Bangalore and Mangalore. A pick up and drop to the train/bus station is arranged by the staff. The uniqueness of the place is the personal touch given to the guests, as the prime force behind this endeavor is “Passion”. The neighboring rain forests is a home for elephants. Not to worry… the home-stay is well secured from the trespassing tuskers! Activity outside the home-stay is prohibited between 7:00pm to 6:00am in the morning. As night draws its curtain, the rainforest comes alive with the sounds of nocturnal fauna. As I watch the dying embers of the bonfire, I lazily warm my feet stretched out on a chair, listening to the “Cranberries” and watching the glow-worms fly by. Share the post "Sakleshpur, Karnataka"